The supermarket delivery man arrives on Saturday morning with a quandary: “Did you order two large pork shoulders? He holds the offending joints in both hands – a culinary scale of justice. He seems deeply sceptical that our little household could scale such meaty summits. CB is meanwhile scanning the list with hawk-like precision. “Well, no, but that’s not really the concern here – you’ve charged me full price for something that I bought on offer. Half price. Do we need to go through the rest of the shop and check that we haven’t been overcharged for all of our other items?” CB waves around the receipt. The Delivery Man now understands, quite rightly, that he and CB are fighting different battles and he’s still losing both of them. Their conversation goes on. He eventually leaves, having somehow struck both of our pork shoulders off the receipt although they remain on our counter top. And so, we come to have 3kgs of pork shoulder – and we were fixin’ for a curry. When we’re not terrorising unsuspecting grocery delivery men, we’ve taken to spending our disposable cash on food and associated paraphernalia. A new discovery is Jamie’s Magazine. This month’s issue had this amazing looking curry – Mangalorean Dukra Maas, which we took and slightly adapted – with fantastic results. The recipe itself takes some time, including some marinating time, but it’s worth it. It doesn’t include anything creamy (unless you add a dollop of yoghurt on your plate – blasphemy, says CB; delicious, says I) but is still incredibly rich. If you don’t have dried kashmiri chillies, pop yourself down to your nearest Asian Supermarket and pick up a bag – we got a huge one for about £2. They have an extremely subtle and slightly smokey flavour that is near on impossible to replicate and they look lovely. The spice mix itself is lovely – very fragrant and moreish – although we’ve looked around, Bafat Spice Mix tends only to be used with pork. I have a sneaky feeling that this would be delicious with lamb or even some skin on chicken pieces. Give it a try and let us know. Although this dish takes a little while to get there, it’s extremely low maintenance. If you’re like me and like to multi-task, put it on in the background while you get on with other household errands (Netflix/doing my nails/anything other than chores). This dish will do well for a lovely winter night in – it tastes even better the next day. If you have time, cook it and leave it in the fridge for a while – these will be the best leftovers you ever have. Quote me on that. 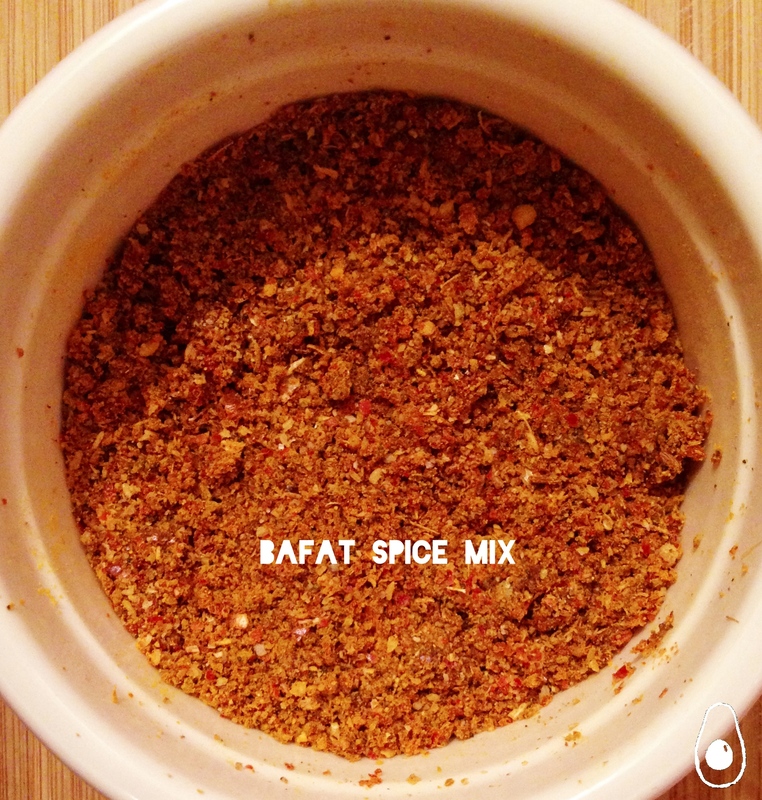 Make the bafat spice mix by dry toasting all the bafat ingredients (except turmeric) in a frying pan for 2-3 minutes over a low heat. Once cooled, use a spice grinder to blitz the spices into a powder. Stir in the turmeric. Blitz the ginger and garlic in a blender until a smooth paste, adding the water and vinegar. 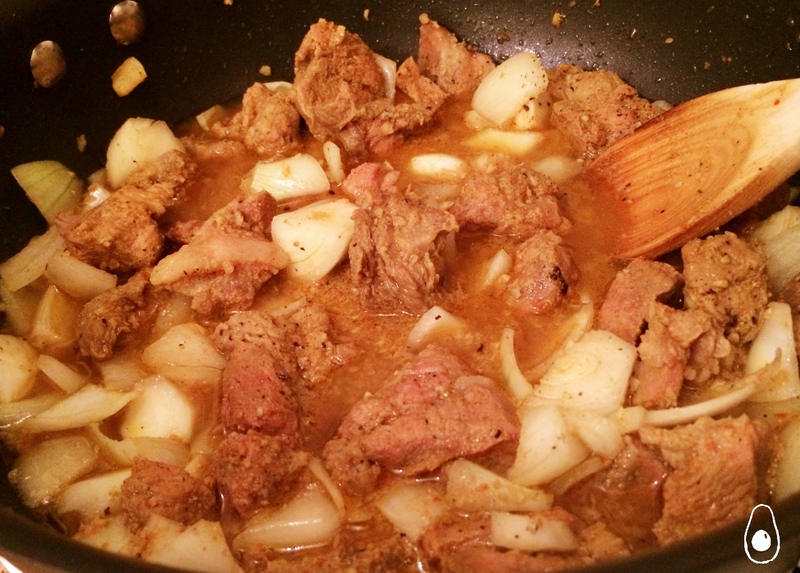 In a large bowl, coat the pork in the spice mix and garlic/ginger/vinegar paste. Leave the pork in the fridge to marinate overnight, or for at least a few hours. Heat the oil in a large heavy-based pan over a low heat and stir the pork and marinade for 2-3 minutes. Add the lid and leave to cook for an hour, stirring halfway through. Add the tamarind paste and onion and season the pork with salt and plenty of pepper. Cook with the lid on for another 50-60 minutes, until the pork is tender. Stir the pork a few times and add a bit of water if it dries out (we didn’t need to). 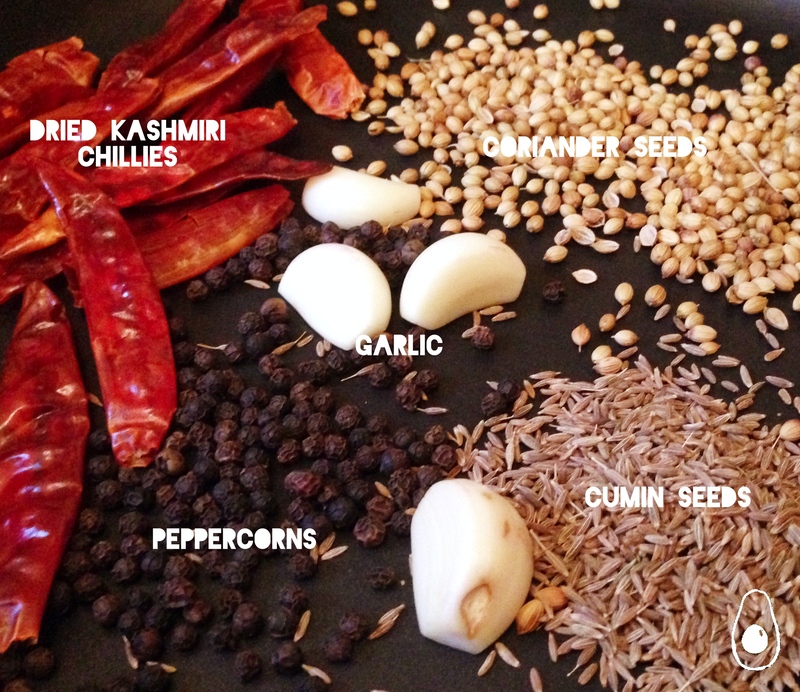 Add garam masala and adjust seasoning to taste. The tangy taste will be offset by the fresh coriander leaves and mango chutney. If you’re so inclined, serve with a dollop of natural yoghurt but the dish definitely doesn’t require it. Taking this one over to Fiesta Friday! Hilarious story, Mandi!! That poor man didn’t stand a chance, did he? This recipe sounds amazing and super easy too – I must take a look at the Jamie Magazine – I am thoroughly enjoying his Comfort Food series on the telly at the moment…Happy Fiesta Friday! Haha, we get our shopping delivered too, I don’t normally check for price mistakes but I always check the substitution list after the time I ordered pears and they didn’t have any, so gave me spearmint gum instead (because sPEARmint)! The argument was definitely worth it because this curry looks soooo good! Spearmint gum to replace pears. That’s a good one! The special blend of spices make this a recipe to take note of. Thanks a bunch for bringing it to Fiesta Friday. Such a funny story! I never order from home cause I am always on the run so i go shopping myself! Thanks for coming and linking up at The Weekend Social. All posts get pinned in our pinterest board! Please be sure to come back next week starting Thursdays at 9PM EST on culinaryflavors.gr ! I hope to see you there!